Catchy and easy to memorize social skills songs provide opportunities for students with autism to learn and role play appropriate ways to interact. Songs were designed by an Autism Specialist and team of Board Certified Music Therapists to accommodate cognitive and auditory processing delays by providing simplified lyrics, additional response time, and slower paced instructions. 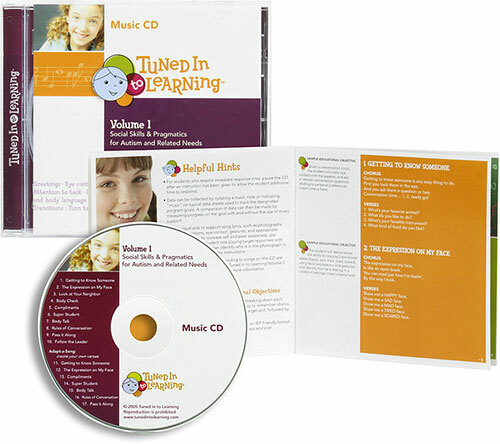 Each song describes a target social skill and provides opportunities for the student to practice the skill by following instructions, answering questions, or imitating body gestures. • 10 original social skills songs and Adapt-a-Song versions, allowing you to modify songs once students have mastered the initial content. • A 12 page full color booklet provides a detailed instructional hierarchy, sample educational objectives, song lyrics, and ideas for using the Adapt-A-Song versions.